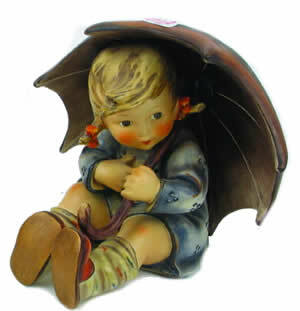 Hummel figurines are based on drawings and paintings of children by Sister Maria Innocentia Hummel, (also known as M.I. Hummel). Her birth name was Berta Hummel and Berta gained her artistic direction at an early age from the Institute of English Sisters. In 1931 Berta entered the covent of Siessen at Saulgua. Two years later she was ordained Sister Maria Innocentia. In 1933 sketches of her work were sent to a publishing company in Munich. Her first artworks were two dimensional and better known as postcards. In 1934, Franz Goebel of the W.Goebel Company became aware of her artwork and sought permission to transform the art into three dimensional figures. This is when the relationship between Sister Maria Innocentia, the Convent and W. Goebel began. In 1946 after a long battle with tuberculosis, Sister Maria Innocentia passed away at the young age of 37 years, her legacy has been carried on through Hummel figurines, which are all based on M.I. Hummels artwork. Do not even think of starting a collection of Hummels without first purchasing a Value & Price Guide. Guides are full of photos, references, history and values. You will also find photos and history of Rare Hard to Find pieces along with Hummel items you may not know existed. Study the guide and know it front to back and back to front. Keep in mind, prices found in guides tend to be retail and higher than items for sale on auction sites like eBay. Try to purchase your Hummel figures at between a quarter and half of the value guide prices. Be aware, the correct spelling is M I Hummel. you will often see auctions listed as M J Hummel, M T Hummel, M I Hunnel and Gobel instead of Goebel etc. 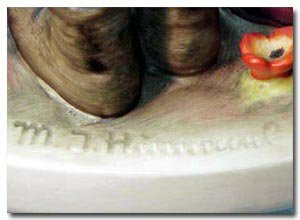 Almost all Hummels will have the M I Hummel Incised Signature located somewhere on the piece. Prototypes and very small figurines are the only pieces that may not have the incised M I Hummel Signature. 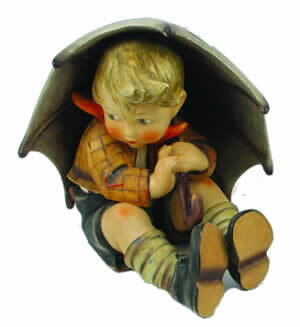 Some collectors and sellers assume that if the name Goebel appears on an item, then it has to be a Hummel. This isn’t necessarily true, the Goebel Company is a factory that produced many good quality items and M I Hummels are just one of them. The basic rule of thumb, if trying to determine whether a figure is a Hummel is, if it doesn’t have the incised signature it isn’t a Hummel. If you have an item that doesn’t have the incised signature, but you believe it to be an authentic Hummel, get it checked by a professional appraiser. There are many rare and unusual Hummel figures to be found. Study your Hummel guides to learn about Doll Face or Faience, Terra Cotta, Internationals, White Over Glaze, etc. There are also major differences in figurines like dress color, flowers or no flowers, eyes open or eyes shut, 5 buttons or 6 buttons, neck tie or no necktie, different label on a bottle, 3 pickets on a fence or 4 pickets on a fence, brown hat or gray hat, etc. Keep your eyes open and pay attention to detail. The Hummel pieces that you aquire should be in as Near Mint condition as possible. Near mint because nothing is perfect. Tip! Try not to buy any Hummel figurine if there are any repairs, chips, cracks, nicks, paint loss or crazing anywhere on the figurine, unless the figure is extremely rare or you are temporarily filling out your collection until a better example comes along.